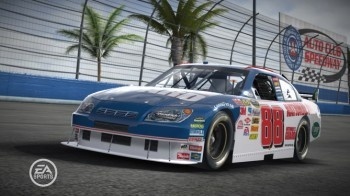 EA Sports President Peter Moore has confirmed that the company has dropped the NASCAR racing franchise from its lineup. Reports that EA would pass on a NASCAR title for 2009 surfaced back in February, when both sides apparently began to question the need for annual updates to the series. At the same time, NASCAR also said it was considering moving to a non-exclusive licensing model when it's deal with EA expired. By all appearances, that relationship has in fact ended, as Moore confirmed yesterday that EA Sports is finished with the NASCAR franchise, not just for 2009 but for the foreseeable future. "There are no plans right now for NASCAR from EA," he said. "We had a great relationship over the years that I thoroughly enjoyed when I first got here. Unfortunately... we had to make some tough trade-offs," he continued. "We've had to redeploy some of those folks. A number of the NASCAR team has moved over now to EA Sports MMA, which will be shipping next year. [We're] still a huge fan of NASCAR, but no plans right now to develop any further games for NASCAR from EA Sports." It's not what I'd call a particularly surprising development. NASCAR has a huge, rabid fanbase but the market for simulators is niche at best and these days the racing genre is dominated by arcade-style "street racers" like the Need for Speed and Burnout series. Even EA's most recent NASCAR title, NASCAR Kart Racing for the Wii, was a cartoonish kart game rather than a real driving sim. New NASCAR-based games will undoubtedly pop up in the near future but I wouldn't expect any serious racing titles to be among them. Now all we need to do is to get rid of NASCAR in real life. Aye. The main reason why many people watch it is for the crashes. Get rid of it! And I think putting GPS systems in the cars would be hilarious, especially if it occasionally told the driver to turn right. I actually like nascar (If you don't, there's no reason to want it gone in real life- just don't watch it) and also am a fan of these games, so i'll be sad to see them go. Hope someone else picks them up at some point. that we need to. i could beat the entire singleplayer game of the Nascar games blindfolded. they dont do enough to be interesting. i perfer Need for Speed: Most Wanted and Carbon, where the AI is programmed on something other then a checkpoint system. I like Gran Turismo or Forza, PGR and old need for speed games like Hot pursuit I haven't played a burnout game in a long time. I am no fan of NASCAR by any stretch of the imagination. But, i grew up in the south and it was just something my family was into. NASCAR 98 was my first PS1 game, so i am kinda sad to see the series go. Didn't they just open up an office in North Carolina strictly for the NASCAR franchise? I am guessing they will be closing it, or maybe I just missed the news on whether or not they even opened it. I don't know about a North Carolina office but I do know that anyone who thinks NASCAR is easy or that people only watch it for the crashes has no idea what he's talking about. Guess it has been about 2yrs, so not a new opening. I'm not sorry to see these games go. YAY! Now it's tainting my beloved Gran Tourismo game >_> Oh well, if any NASCAR fans still want their fix they can pick up GT5. I think you missed a few points, i was once a really big nascar fan. Its not that easy to get a car to run 190 MPH for 2 and a half hours...but i digress. The games were never that great, same problem the F1 series games faces, you just cant replicate the experience well enough. Im sure someone else will pick it up, with how big the sport is, its only a matter of time. No, but that doesn't mean watching it is exciting. You know what else is difficult? You don't see people lining up for miles to watch that go down. "WOW I WONDER WHAT HE'S GONNA DO NEXT!" "OH SWEET HE'S TURNING LEFT! WOOOOO!" I always hated these games, though I did enjoy turning around and crashing into people. True. Then again i never said anything about its entertainment value. If its not your thing then great, its not my thing any more either. Doenst mean im going to go running my mouth about it completely uninformed. I'm automatically informed about NASCAR. I also know how to tie a noose. Yea seriously maxi, dont take down that Dale #3 off your wall just yet. I can see you tail gaiting down in talladega speedway with all your "cousins". Sayin' "y'all" every other word. I was hoping for "Nascar Underground" where the player has to become the top driver in an underground community of nascar rebels who race on a mirrored track! Right turn action!